The Hermitage is the largest museum of Russia. It ranks among the four largest museums of the world, such as the Louvre in Paris, the National Gallery in London and the Metropolitan Museum in New York. The collections here number a little less than 3,000,000 items: paintings, sculptures, object of applied art, etc. They are divided into seven departments: the department of primitive civilization, of Antiquity, of Russian culture, two departments of oriental culture and art, a very rich department of West-European culture and art, and a section of numismatics, where coins, medals and orders are on display. 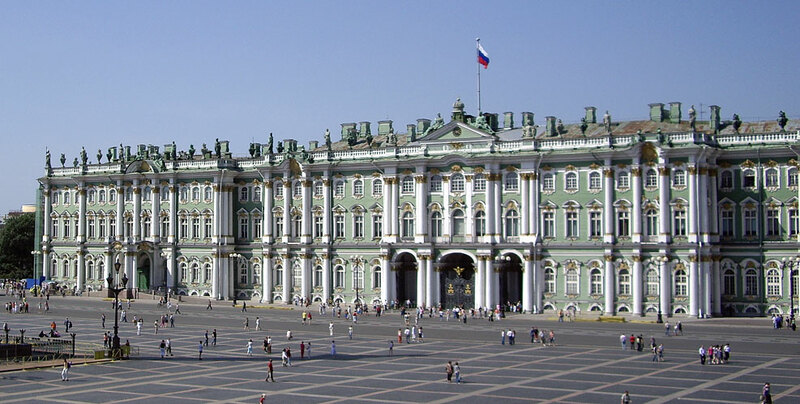 The museum occupies five buildings: the Winter Palace, the Small Hermitage, the Old Hermitage, the Hermitage Theater, and the New Hermitage. The oldest of them, the Winter Palace of the Royal family. It was being built since 1754 to 1762 to the design of the architect Rastrelli, who was an exponent of the Russian baroque style. But there was the fire in the palace in 1837. It raged for three days and after it only charred walls remained, so what we see today is the nineteenth century building restored after the fire by the architects Stasov, Bryullov and some others, in keeping with the architectural styles fashionable in the late 1830s and the following years. The exterior was restored to its original design but the majority of the interiors were redecorated in the late Classical or Eclectic styles. Only two rooms in the palace were restored to their original design. And here is one of them - the Main Stairway. has all the features of the mid-eighteenth century baroque interior, such as, gilt wood-carving, sculptures, mirrors set in the walls to destroy their flatness and achieve an illusion of more space and height, and a painted ceiling - it is decorated with the 18th century Italian painting representing the Gods on Olympus. The Main Staircase was used only for official receptions, so it’s called The Ambassadors’ Stairway. 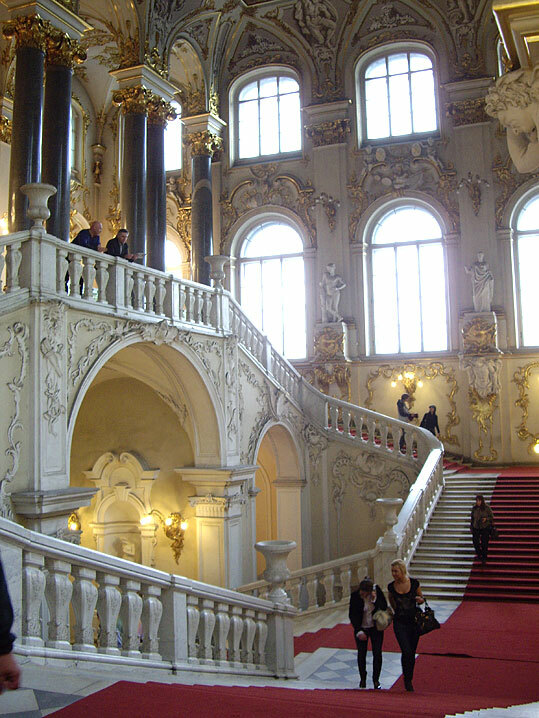 It is one of 117 staircases of the Winter Palace. is designed after the fire by the architect Stasov in keeping with classical style. The walls are faced with artificial marble which was often used for interior decoration in the period of Classicism. Note the symmetry of the ornamental elements, a fine stucco work and a ceiling painting in monochromatic technique, typical of Classicism. The largest chandelier of the palace is in this hall, it is made of gilded bronze and has a very complex pattern. Before the fire of 1837 there were portraits of Russian field marshals in all shallow niches between pilasters. We can now see only one of them. On display in this hall there is the early18th century carriage of French make which was used by Catherine the Great during the coronation. 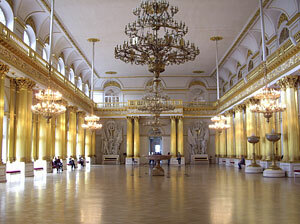 is also called The Memorial Room of Peter the Great. It was decorated in 1833 by Auguste Montferrand and after the fire redecorated by Stasov almost without alterations. In the recess there is the throne chair made for the Russian Empire by a British silversmith. Above it there is a painting by the 18th century Venetian artist Jacopo Amiconi representing Peter the Great beside the goddess of wisdom Minerva. The walls of the room are covered with Lyon velvet with double-headed eagles embroidered in silver. The parquet floor is inlaid with fourteen kinds of valuable wood. The chandelier, tables, candle supporters are made of silver. Overhead on the side walls there are two panels representing Peter I in the battles in Lesnaya and Poltava. or The Armorial Hall which occupies the area of 600 square meters was designed by Stasov. The hall owes its name to the pictures of the coats of arms and the heraldic emblems of all the provinces of Russia which are on the plaques attached to the chandeliers. The hall was used for official receptions. On display in this room now is silverware made in different West-European countries in different periods of time. In the center of the room there is a decorative urn carved from one piece of jasper. Of great value is a small table made in Naples in the early 18th century from tortoise shell, mother of pearls and bronze gilded. also known as the Large Throne Hall, is solemn and austere in appearance. It occupies the area of 800 square meters and is decorated with white Carrara marble imported from Italy and gilded bronze. The parquet floor, made from sixteen kinds of valuable wood, mirrors the pattern of the ceiling. The chandeliers are decorated with the emblems of the Russian Empire - the double-headed eagles. On the wall above the throne chair there is a marble bas-relief representing St.George Slaying the Dragon, executed by the Italian sculptor Francesco del Nero after a drawing by Stasov, who designed this room in 1842. If you turn back you’ll see two green malachite vases and two blue vases made from lapis lazuli. From here our way lies to the Small Hermitage building. We are now in the Small Hermitage. Between 1764 and 1775, according to the plan made by Yury Felten and Vallin de la Mothe, a building of small proportions was erected adjacent to the Winter Palace. This was known as the “Hermitage” from the French word ermite, which means a place of solitude, a solitary corner. It was used by Catherine the Great for unofficial, private receptions. The art collections were accommodated in two galleries and here, where we are now, there were several small rooms which no one could enter, but Catherine and her intimate friends. That’s why the place was called Hermitage. In 1856 the architect Andrei Stakenschneider redesigned the building and at the site of the small rooms of Catherine’s time built this Pavillion Hall, which is an example of the eclectic style of the 19th century. Please, note the asymmetry of the room: there is a niche on one side and a stairway on the other. It leads to the gallery where musicians used to sit. 26 crystal chandeliers decorate the room, and there are four fountains of tears. A fine view opens onto the Hanging Garden, laid out in the 18th century on the roof of the former stables. Not suitable for the accommodation of paintings, the hall is used to exhibit Russian and West-European mosaics. In the center of the hall there is a floor mosaic, a copy of an ancient Roman original now preserved in the Vatican Museum. It was completed between 1847 and 1851 by Russian artists who studied the art of mosaic in Rome. This copy is one half of the original size. Another exhibit of interest is the Peacock Clock. It is under the glass cover, by the window facing the Neva-river. 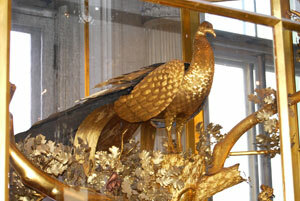 The Peacock Clock was made by the 18th century British master James Coxe. It was brought to St. Petersburg by boat and was presented to Catherine II by Count Potyomkin. The clock is in a good working condition though its mechanism is not used every day. When it is set to work, and the clock strikes, all the decorative parts start moving: the bells in the cage ring, the owl turns its head round and blinks, the peacock spreads its tail, then turns round to show the back side of the tail to the viewers. Finally, the rooster begins to crow. As the clock is a creation of the period of the Enlightenment, its design has a deeply philosophic meaning. It conveys the idea of movement, development, growth. Hours pass, and the night, personified by the owl, turns into morning, personified by the rooster. Seasons change each other; winter is followed by spring and summer, and bare branches of trees become leafy. And the man passes different stages of life, living through his own dark and light periods, and having his own noon - right in the middle of his life span, designated with the peacock - the symbol of happiness of family life. The idea of natural flow from life to death, although clearly expressed, does not imply any tragic feeling. It is replaced with the idea of steady progress from darkness, illiteracy, infancy to light, knowledge, and life experience. Please, follow me to the Old Hermitage building. We are going to pass the staircase known as the Councillors’ staircase. It is called so because members of the state council used that stairway to come to meetings presided over by the emperor. On the landing you’ll see a big malachite vase made in 1843 in mosaic technique (thin layers of stone are skillfully arranged in an attractive pattern and stuck to the base with a special putty). We have come to the Old Hermitage building, designed by Felten in 1787, but in the 19th century redecorated by Stakenschneider. The building was used as additional palace premises. Now it houses our Italian collection which is exceptionally rich and includes the masterpieces of Giorgione, Titian, Leonardo da Vinci, Raphael, Michelangelo and many other famous Italian masters. On display in this room are Italian primitives. The earliest we have belong to the late thirteenth century. We lack Giotto in our collection, but have some artists belonging to Giotto’s school: Aretino, Gerini, Firenze. Here are the typical mediaeval devotional images, painted in tempera on wooden panels, representing saints on a golden background. Italy of that time was quite different from mediaeval countries, such as Germany and Austria. It started a new social bourgeois set up which gave impetus to the economic, scientific and cultural development of the country. There arose a new optimistic approach to life, a strong belief in reason and in potentiality of man. Both literature and art reached a high peak. This new stage in the development of West European culture became known as the age of the Renaissance. The ideals of antiquity were revived. Some leading cities developed as republics. They had their own rulers and developed their own artistic trends. Among the most powerful were Florentine and Venetian schools of painting. We’ll see some Florentine and Venetian artists, but let me start with the Madonna by the fourteenth century artist Simone Martini who hailed from Sienna. This school was much less powerful but is known for its elegance. This is the right wing of a diptych representing the Annunciation scene. Its left part with Archangel Gabriel is the USA. 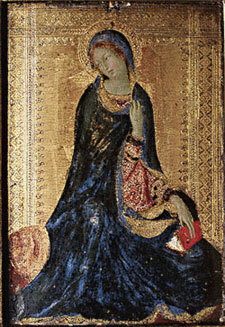 On the one hand, it is a typical mediaeval image representing the Madonna on the golden background. On the other hand, it has a poetic look characteristic of the Early Renaissance. Two parallel suites of rooms start from this hall. One of them is devoted to Florentine art, the other one - to Venetian art. Let’s first see the Florentine gallery. Here on display is a rare piece of fresco by Fra Angelico da Fiesole, the Madonna and the Child with St. Dominic and St. Thomas Aquinas. It was painted in the 1440s on the refectory wall in the monastery of San Domenico in Fiesole near Florence. It is a good example of how in art the old is replaced by the new. The figures have acquired a three-dimensional quality, the faces have an individuality of their own, and the gold background has been replaced by a blue sky. The 15th century Florentine majolica is displayed in this room. Of special interest is the Nativity by Giovanni Della Robbia which was used for interior imbelishment of the church. (Majolica objects are made of red clay coated with opaque glaze. While the clay is wet, it is painted, then baked, then covered with glaze; terracotta is red clay baked but not covered with glaze.) The museum has a good collection of majolica pieces by the Della Robbias. Most of them are kept in storage rooms. In this small room all paintings are of great value. There are two canvases by Botticelli, St. Dominic and St. Jerome. Botticelli was a student of Philippo Lippi and a teacher of Philippino Lippi. He followed the traditions of the Florentine school, but at the same time was different from the other Florentine masters. Botticelli belonged to the court of Lorenzo Medici, the ruler of Florence in the early 16th century. That was the golden time for painters, musicians and poets. We, however, cannot boast of the best pieces by the artist. We have only two late Botticellis, which belong to the time when the church and the conceptions of Savanorolla overshadowed Medici. Our Botticellis, full of mycticism and gloomy spirit, reflect the reactionary atmosphere of the time, and are typical of the decline of the Renaissance in Italy. Among the gems of the collection are the two paintings by Philippino Lippi, who was a court master to Lorenzo Medici, the Magnificent: the Adoration of the Infant Christ and the Annunciation. These two paintings give an idea of the artist’s exquisite and elegant style, tending to a detailed description of the scenes. On the opposite wall there are two paintings by Perugino, the Portrait of a Young Man and St. Sebastian. Perugino represented the Umbrian school of painting and was the teacher of Raphael. Everybody knows that St. Sebastianwas an early Roman Christian martyr. He was persecuted by Diocletian and suffered death from poisonous arrows. He was saved by St. Irene, then executed again, pierced with poisonous arrows for his adherence to Christianity. But we don’t see any traces of sufferings or martyrdom on the face of Perugino’s St. Sebastian. The artist was a typical child of the Early Renaissance who was more interested in showing the beauty of a human body of ideal proportions than in detailed treating of a religious subject. The artist used an arrow to paint his name on it. Before seeing the next room let’s go to the Venetian gallery to see the paintings by Titian. The Venetian Renaissance started a little later than Florentine, and borrowed some features of the Florentine school of painting, but the Venetian masters used a different color scheme. Nobody in Florence could produce the bright colours that can be found on the Venetian canvases. The famous 16th century Venetian artist Titian, who headed the Venetian school of painting for more than half a century, is represented in the Hermitage by eight canvases belonging to different periods of his long life. Titian took his subjects from the Bible and Greek mythology, but he got his greatest fame as a portrait painter. Let’s start with his outstanding masterpiece Danae , created in 1554. The subject was taken from Greek mythology. According to the myth, Dana e was the daughter of Acritius, the king of Argos. Her father was predicted by an oracle that he would be slain by his grandson. So he confined Danae in a bronze tower. But Zeus fell in love with Danae and descended to her in the form of golden rain. She gave birth to Perseus who later slew his grandfather with an accident throw of a discus. The prediction came true. One can see the head of Zeus in the clouds and the sparkling flow of coins falling upon Danae , which was a canonical way to show the descent of Zeus to Danae . The painting is based upon the colour contrast of the nacre-pink body with the cold tone of the white sheet and the purple canopy of the bed. The perfect proportions of Danae ’s body are evidence of Titian’s adoption of the classical ideal of beauty. The painting Repentant Mary Magdalene belongs to the artist’s mature works. It was painted in the 1560s. The artist focuses attention not on the ascetic idea of the Christian legend, but on the figure of a young woman who even in grief can look beautiful. The agitated state of Magdalene is echoed in the landscape with the lightning aglow in the dark blue thundery sky and the solitary tree bending in the gust of wind. On the opposite wall there is St. Sebastian, created when Titian was in his nineties. It is full of dramatism typical of the decline of the Italian Renaissance. 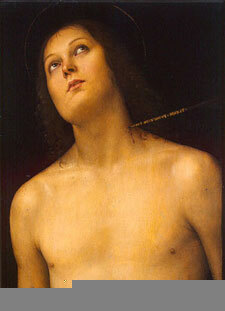 This St.Sebastian has nothing to do with Perugino’s St.Sebastian. He is full of suffering. The arrows seem to be piecing St. Sebastian from all the sides giving no chance for him to escape death. And the body of the martyr is in a complex twist enhancing the dramatic effect of the painting. We are now in the hall called “The Small Field-Marshals Room” from the bas-reliefs with the portraits of Russian field-marshals: Suvorov, Rumyamtsev, Potyomkin, Kutuzov and others. There are six doors here made in the workshops of the famous French master Bulle. The doors are made of tortoise shell and bronze gilded. On display in this room there are two paintings by Leonardo da Vinci, the greatest master of the High Renaissance, who was an extremely versatile person - a painter, an architect, a musician, an engineer, and a scientist. The Benois Madonna, sometimes called Madonna with a Flower, was painted in oil around 1478 in Florence. The smiling, youthful Madonna in a smart dress of a Florentine townswoman, is holding a flower, shaped like a cross. The mist called sfumato, typical of Leonardo’s work, lends the faces an unusual expressiveness. The painting was purchased in 1914 from the family of the architect L.Benois, who is supposed to have bought it from the wandering Italian circus. Leonardo was 26 years old when he painted this Madonna. His main concern in art was to bring it nearer to nature. Leonardo evolved the perspective and painted the Madonna in a very secular way. Her clothings are like all women used to wear. The face of the Madonna is said to be the face of Leonardo’s stepmother. The other painting by Leonardo is on the other stand. It is called The Litta Madonna, because it was painted for the family of Littas in Milan and it was purchased from the Duke of Litta collection in 1816. One can see the perspective, a very balanced and simple composition, and perfect proportions of a human body. Here Leonardo found his style and that serene atmosphere hence forward characteristic of his paintings. This work of Leonardo evokes a feeling of tranquility, calm and harmony. This Madonna is painted in tempera, it is not an oil painting. The artistic trend called Mannerism sprang up in Florence towards the decline of the High Renaissance. Later this movement became widespread in other Italian cities and abroad. It marked a departure from humanistic traditions of Renaissance art. Mannerists neglected what was attained during the earlier period. Their works were characterized with a deliberate affectation of style and form and colour scheme. The word “mannerism” reflects the tendency to concentrate on manner more than on the inner world. Here is the painting by Jacopo Pontormo Madonna and the Child with St. Joseph and John the Baptist, with its pure colours and distorted proportions of the bodies. The artist wrote, ‘I found the way to overcome flatness’, but this representation is flat. All the canvasses on display can be attributed to mannerism, for their linear rhythms, distortion of forms, liberty with usage of colours, and an air of mysticism. The edifice of the theatre was designed by Quarenghi in 1783 (completed in 1787). The theatre retains the original style both in the facades and the interior, displaying a magnificent dress-circle. It has a seating capacity of 500 persons and is used at present as a lecture hall as well as a theatre. From here we can see the foyer of the theatre designed in the Rococo style. The museum contains the reproduction in the original size of Raphael’s celebrated loggias, erected in the Vatican Palace by the architect Bramante and painted between 1516 and 1518 by the students of Raphael after his sketches and under his supervision. The loggias form a high, well-lit gallery the ceiling of which is decorated with 52 paintings based upon biblical stories interpreted in the spirit of the Renaissance. The designs were made by Raphael himself. As for the walls, they are completely covered with paintings in which motifs from classical mythology are interwoven with plant designs and the representations of animals and birds. And you’ll never find two similar ones. Serving as a model for the design of the loggias was the decorative ornamentation of the ancient Roman termae of Titus, the excavation work on which was led by Raphael. The Hermitage copy was made at the end of the 18th century by a group of artists, who carried out copying in the Vatican. The difference from the original loggias is that Italians used the fresco technique, and these are canvases stretched out on frames and inserted into the walls of the gallery specially built for this purpose by Giacomo Quarenghi. We are now in the New Hermitage, erected in 1839-51 to the design of the Munich architect Leo von Klenze. The New Hermitage was constructed as a museum building, intended to contain the artistic collections of the royal family. The museum was opened to the public in 1852 and was called the Imperial Hermitage. As it was the property of the royal family, the admittance was restricted by a number of regulations. Now the building houses the collections of Italian, Spanish, Dutch and Flemish art, as well as antiquity on the 1st (ground) floor. In this room we have the continuation of our Italian collection. The pieces of furniture, majolica, tapestries, paintings, a sculpture are of Italian make. On the wall there is a cartoon by Raphael’s pupil Giulio Romano titled The Triumph of Scipio, one of the 22 cartoons comprising the series devoted to the Roman general Scipio Africanus. Only two have survived. The second is in the Louvre. Raphael himself frequently made cartoons for tapestries. The subject is taken from Roman history. The tapestry represents the feast of the ancient Roman military leader Scipio Africanus and his triumphal procession after the victory in the Second Punic War. The room contains Renaissance furniture - carved chairs and armchairs and cassone trunks for a bride’s dowery (which look like antique sarcophagi), carved and gilded. The cases contain numerous specimens of Italian majolica: banqueting services, basins for cooling wines, plates with portraits of brides or grooms which were presented to newlyweds, and apothecary containers. Some are with pictures by famous painters, including Raphael. There are two stands in the room displaying the paintings by Raphael. The Conestabile Madonna was painted by Raphael between 1502 and 1503, when Raphael was a very young man. (It came from the Conestabile collection, Perugia, 1870). This painting belongs to Raphael’s Umbrian period and we can trace here a technique typical of Perugino. The lyrical lanscape reflects the place where the artist lived. (He was born in Urbino.) This small picture is remarkably humane, imbued with harmony and lyricism. The young artist creates a figure full of dignity, nobility and purity. The frame is said to have been carved and gilded by Raphael himself because originally it formed part of the panel on which the picture was painted. In the 19th century the work was transferred from panel to canvas. When it was put onto canvas, the reverse side of the painting was revealed showing Raphael’s original sketch which depicted the Madonna holding a pomegranate. The pomegranate was replaced by an open book in the final version. Hence the other title of the painting: Madonna with a Book. The second painting by Raphael in this museum is a more mature work. Follow me, please. This Holy Family was painted in Florence a few years after the Madonna Conestabile (in 1506). In the Holy Family Raphael attained the majestic simplicity, clarity and harmony characteristic of the High Renaissance. The picture has a very balanced composition reminiscent of Leonardo. One more feature that brings it close to Leonardo is the fact that Raphael treated the scene as a real story. 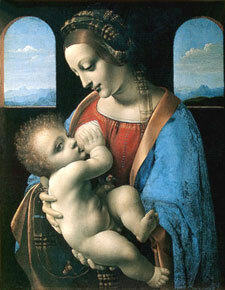 For example, the Madonna has a hairstyle and clothing worn by Florentine women in Raphael’s time. And Joseph is shaved off, as the Florentines didn’t grow beards at that time. On the other hand, the characters lack individuality. The exalted figures of the Madonna and Joseph, stripped of all incidental features, represent types rather than individuals. In one of his letters Raphael revealed the essence of his method of creation: “to paint a beautiful woman I should have to see a large number of beautiful women; but as there are few beautiful women and few true judges, I take as my guide a certain idea...” In the Holy Family the type of the ideal man corresponds to the humanistic conceptions of the human personality. The fact that. Raphael has shown St. Joseph without a beard caused the second name of the painting - the Madonna with the Beardless Joseph. Saint Joseph was usually depicted as a bearded old man. The prototype of Joseph was Raphael’s friend, a famous architect Bramante. In the centre of the room is the fountain sculpture, called Dead Boy on a Dolphin. It was created by Lorenzo Lorenzetto after a drawing of Raphael. The works by Michelangelo are extremely rare outside Italy. The Hermitage possesses one sculpture, the Crouching Boy. It was created in the early 1530s and was intended to adorn the tomb in the Medici Chapel in Florence. The sculpture is in a roughly finished state: it is not polished, there are no toes, one can easily see traces of the chisel on the back of the boy. During the crisis of the Renaissance, when Michelangelo realized that the humanist dreams of man’s freedom were not to come true, he frequently turned to dramatic figures, like this one. The onset of reaction and the crisis of the Renaissance, which Michelangelo experienced so tragically in Florence, gradually spread all over Italy, influencing the art of the second half of the 16th century. A number of new trends appeared. We’ll see how the Italian art developed in the next room. Please, follow me. 1)The New Hermitage building includes the so-called sky-light rooms specially designed to display large-scale paintings.The decorative furniture sets add to the beauty of the rooms. I d like to draw your attention to these table-tops and vases made of LL as well as rodonite stand lamps. In the next room the similar table-tops and vases are made of malachite.The majority of canvases displayed in this hall date back to the late 16th, 17th, and 18th centuries and were created by Italian painters which represent deferent artistic schools. In 1582 the Bologna Academy was set up by the Carracci brothers, Annibale, Agostino and Lodovico. The Hermitage possesses a large collection of paintings by artists of the Bologna Academy. In contrast of Mannerists, the Bologna Academy developed a strict system of art, in which they pursued the ideal of the beauty not in nature but in the world of ideas. The painting to the Gospel subject of the Holy Women at the Sepulchre belongs to the brush of the head of the Bologna Academy, Annibale Carracci. On the opposite wall there is the only painting by Tintoretto in the Hermitage, The Birth of John the Baptist. The artist treated the religious subject as a genre scene. He showed the women nursing the new-born child, the decor of the room, the cat creeping towards the hen, and the brazier on the floor - everything takes us into the atmosphere of the sixteenth century. 2) The hall (in the very center of the New Hermitage building) houses decorative canvases, which are good example of the Italian Baroque style. Look at The Centaurs’ Fight with the Lapithae by Luca Giordano nicknamed Fa Presto, meaning “painting quickly”. The Centaurs were invited to the wedding of the Lapithae. They got happy and started stealing the girls from the Lapithae. 2) Next room. There are on display some decorative canvases by the artists representing the Italian Baroque style. The art of the Baroque is based on the philosophy different from that of the Renaissance peroid. In contrast to the artists of the Renaissance the masters of the Baroque didn’t see anything stable in life, any order in the Universe, and didn’t believe in man’s power and reason. The paintings of the Baroque masters are multifigural compositions, full of movement, where there is nothing still, stable or tranquil. The turbulent world was shown as a mixture of contrasting features, a good example of this mixture being the Centaurs themselves - half men, half horses. The Baroque paintings are always very decorative. On the same wall there is the Reception of the French Ambassador in Venice by Canaletto with the Doges’ Palace in the background. 3) The exhibition of Spanish art takes two rooms and embraces a period from the late 15th century up to the 19th century. The collection of Spanish art at the Hermitage is not so big as the collection of Italian art, but compared with what the other European museums possess, it can be regarded as a rich one. We have two paintings by Diego Velazquez, one of the greatest masters of the 17th century Spanish Baroque. Unlike most of his contemporaries Velazquez painted very few pictures on religious subjects. From his early period there is Luncheon (1618). Although the still life is wonderfully painted, this is not a very mature work. The Portrait of Count Olivarez (1640) is painted with wonderful mastery. Count Olivarez played a vital part in the life of Velazquez. Through him Velazquez got invitation to Madrid and became a court painter. Velazquez never flattered anybody and, painting Count Olivarez, he created the portrait of a self-confident, cunning and powerful man, who was not devoid of vices and knew what he was after. El Greco. One of the gems of the collection is The Apostles Peter and Paul by El Greco, painted between 1587 and 1592. The artist portrays here two complex characters, two conflicting natures. The pale aged face of Peter, his sad, pensive gaze, the line of the drooping shoulders, the hand sagging beneath the weight of the key, reveal his humble, gentle and indecisive character, inclined to meditation and doubt. Paul is represented as a powerful personality, a man of strong character. He has the high brow of a thinker and the fiery eyes of a fanatic. El Greco’s paintings often didn’t appeal to the commissioners, because the saints painted by him did not cause any desire to prey. Our Dutch collection of the 17th century is particularly rich. It ranks among the best in the museum. Of special value in it are the paintings by the greatest Dutch master Rembrandt van Rijn. The Hermitage possesses 26 paintings by Rembrandt, a few drawings and almost all of his etchings. Rembrandt was born in 1606 in Leiden, where he started his academic education. 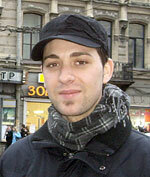 Then he moved to Amsterdam and began his career as an artist. In 1634 he married the daughter of a well-to-do Amsterdam burgher, Saskia, and thereafter the figure of his wife appeared in dozens of paintings. She became his permanent model. Flora (1634) belongs to the first period of Rembrandt’s career, when the artist was in fashion and at his prime. 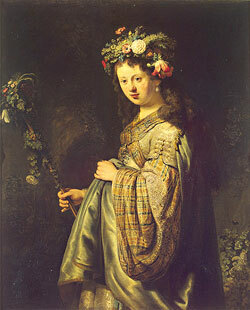 Here Rembrandt portrayed Saskia as the Goddess of Fertility, Spring and Flowers, with a nosegay, and crowned with a spray of flowers. She is painted like a typical Dutch woman with the national flower, tulip, in the spray of flowers on her head. Flora is in a very unusual garment of oriental style. Rembrandt’s hobby was to collect objects of oriental art: fabrics, weapons, and other pieces of applied art. He often depicted them in his paintings. Danae (1636). It is easy to tell Rembrandt’s Danae from Titian’s picture to the same subject. For Rembrandt no beauty existed without inner emotions. He painted a woman waiting for the person she is in love with. No golden coins. That was not important for Rembrandt. He painted golden sunrays which illuminate Danae’s animated face and her outstratched hand. By the way, later Rembrandt repainted the face of Danae, and now it is the face of the artist’s second wife, Hendrike Stoffols. Rembrandt treated the mythological subject with freedom hitherto unknown. The colour scheme is characteristic of his early paintings: olive, green cold colours. You might have heard that this painting had a very tragic fate. Over 15 years ago it was damaged by one of the visitors of the museum who sprayed it with acid and cut it twice with a knife. After that act of vandalism the painting was in an awful condition and we seemed to have lost it for ever. For longer than ten years a group of restorers was reviving the canvas, and this is the result of their work. If you look attentively at the canvas you will see the traces of damage. On the canvas we see the moment when, having received God’s command, Abraham is ready to offer up his son Isaac to confirm his faithfulness to God. But at the moment Abraham was about to deliver the blow an angel appears. He diverts Abraham’s hand and the knife falls to the ground. Dynamics wasn’t typical of Rembrandt. He wasn’t after it. He expressed inner life in static bodies. But here he tried to convey motion. You feel that in a second Abraham would have slain his son. Rembrandt’s talent gave all characters a human origin. Abraham, like any father, couldn’t see the face of his son at that dreadful moment, he covered it with his hand. Descent from the Cross (1634) is a real masterpiece. Even treating religious subjects, Rembrandt always depicted his motherland (atmosphere, clothes, the looks of the people). The artist shows a group of Christ’s disciples, with the Madonna being an elderly woman, who fainted. Rembrandt breaks the tradition of representing the Madonna. Here she is a mother, a woman, not just an image from the Bible. Like Caravagio, Rembrandt knows how to convey the play of shade and light, but light for Rembrandt was a means of conveying emotions. We physically feel the weight of Christ and feel the dramatic tension of the scene. In fact, the scene (the descent from the cross) took place at night. Usually artists ignored the fact. Rembrandt used it to lend the picture an emotional color. Parting of David and Jonathan (or David’s Farewell to Jonathan) (1642) is the first picture by Rembrandt that ever got into Russia. It was bought by Peter I. Jonathan, the son of king Saul, warned his friend David of a danger and the latter decided to leave the country. He was suspected by Saul of an attempt to seize his power. The painting was created the year when Saskia died. In a letter to a friend Rembrandt said that he didn’t paint the face of David, for it was he who was weeping himself. The Holy Family, painted in 1645, depicts the family of a carpenter. Here kindness, tranquility and peace reign supreme. Rembrandt’s colours during these years became warmer, a golden red predominating. The last twenty years of Rembrandt’s life are represented in the Hermitage by a number of portraits and two paintings to religious subjects. When Saskia died Rembrandt had to sell out his house and the collection of oriental things. He moved to the poor Jewish quarters of Amsterdam and since that time he painted the Jewish people, his friends and neighbours who were kind to him. On the opposite wall there is the Portrait of the Rabbi (or the Portrait of an Old Man in Red). The painting subtly conveys man’s inner world.The face and hands are touched with light, the rest - details of dress and the surroundings - melt away in a warm semidarkness. The Return of the Prodigal Son was painted in 1669, the year when the artist died. It is one of the last pictures painted by Rembrandt. It took him two years to accomplish it. Rembrandt was so poor at the end of his life that he couldn’t afford buying a new canvas. The Prodigal Son is painted on a used canvas, that is why the colors are dark. The painting was purchased for the Hermitage in 1766. It represents a New Testament parable. By that time Rembrandt had lost his both wives and the son Titus. His life experience helped him to show a story of a reckless youth, a disreputable son who wasted all his wealth in riotous living and became a tramp. Later having repented, he returns to the house of his father who pardons him. We see the moment when the blind old man, bending over his son, tenderly touches his shoulders, the face and hands of the father expressing love, affection and forgiveness. This highly emotional painting is a result of Rembrandt’s tragic life. Tent Hall. Look at the shape of the ceiling reminding of a tent. On display here is the exhibition of Dutch art which is the oldest in the museum. It was started by Peter the Great and is now among the finest collections of the Hermitage. Very well represented in this museum are the Little Dutch painters of the 17th century. Holland was the country of the first bourgeois revolution, which set a new way of life. Dutch bourgeoisie didn’t live in huge palaces. The main point about their houses was comfort and elegance. Dutch paintings were created to fit those houses and they are of small size compared with the paintings meant to decorate big Venetian or Florentine palaces. The range of the subjects treated by the 17th century Little Dutch painters is as follows: 1) landscapes of Scandinavian countries 2) animalistic scenes 3) still lifes 4) interiors (genre scenes) 4) portraits. 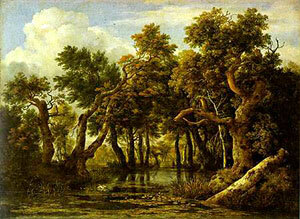 The most successful landscape painter in the second half of the 17th century was Jacob van Ruisdael. There are 11 paintings by him in the Hermitage. One of the most celebrated works is The Marsh. Ruisdael was an artist capable of reproducing all the diversities of nature with profundity unknown previously in Dutch art. The painting titled The Punishment of a Hunter by Paul Potter consists of 14 different panels with hunting scenes painted with a great sense of humour. Many people in Holland were devoted to hunting. And the painting shows what would happen to a hunter in case of violating the rules of nature. 1) The Vision of St. Hubert. The plot is derived from the Biblical legend. St. Hubert had a vision of a deer, because he, being an enthusiastic hunter, didn’t stop hunting even on Good Friday. 2) Diana and Acteon. The subject is borrowed from antique mythology. Diana was bathing in the river. She turned the hunter Acteon into a stag because he saw her bathing. 3) Rabbit hunt 4)Leopard hunt, etc. 13) Trial of the Hunter. Everyone who would violate the rules of nature would be punished. The jury: Fox - the Secretary. Lion - the Prosecutor 14) Punishment of the Hunter. Fire is prepared to roast the hunter. Two dogs are hanged. The victory of justice. Exceptionally rich is the collection of genre painting. Here is The Physician Visiting a Sick Girl by Jan Steen, displaying the artist’s sense of humour. Steen treated this subject a number of times. On the back of one of his versions he wrote, “No medicine can help if the cause of the disease is love”. There are five canvases by Terborch, of which the Glass of Lemonade, Reading a Letter, and the Portrait of a Woman are in his best and most finished manner. Terborch achieved a real mastery in the rendering of the texture of the objects, the sheen of silk or the softness of velvet. Frans Hals was a prominent master of realistic portrait. He worked in broad dashing strokes of the brush, never really finishing any details, so that a complete picture keeps the freshness of the first sketch. The Portrait of a Young Man with a Glove and the Portrait of a Young Man. The collection of Flemish painting is one of the oldest and richest at the Hermitage. The bourgeois revolution in the Netherlands in the late 16th century gave birth to two new states: Holland and Flanders. Flanders was still dependant on Spain, whereas Holland got independance. The beginning of the 17th century put an end to the disastrous wars between Holland, on the one hand, and Flanders and Spain, on the other hand. The arts of both countries reached their peak. Flanders soon became one of the most highly developed countries in Europe. The museum owns 22 paintings, 19 sketches and some drawings of Rubens, the great Flemish artist of the early 17th century. He was an extremely versatile person, a humanistic philosopher, who treated Greek mythology and Bible, landscapes and portraits, historical subjects and what not. Though he was an aristocrat, his paintings are close to folk art and have roots in robust life of the Flemish people. Rubens was a diplomat as well as a painter. His letters show him as an authority on subjects varying from archeology to philosophy and politics. He was engaged in the religious and political struggles of his time, constantly working for the restoration of peace in Europe. Rubens learned the legacy of Netherlandish painting, and followed the traditions of Peter Breigel the Elder. He was also acquainted with Antique and Italian painting. He was born in Antwerps but spent eight years in Italy (1600-1608), where he got his artistic education. Italian influence is felt in his works but the traditions of old masters only helped him to work out his own style. The artist is a careful observer of life. Rubens is known to be the greatest representative of Flemish baroque with its national images, life-asserting spirit and vivid forms. The Union of Earth and Water, painted around 1618, is one of the finest of the artist’s early works, in which the symbolic union of the goddess of the earth, Cybele (with the horn of plenty - the symbol of fertility and richness), and the god of the sea, Neptune, personifies peace and the prosperity of the state. The artist uses a large-figured, balanced composition which is opened up to the viewer. There is hardly any depth in the picture: the figures are shown against the background of a rock right next to them, and the stream of water, in which cupids and Triton blowing a sea shell are splashing is trickling towards us. The union of earth and water, which is an essential condition of fertility, affirms life. The painting can be called a jubilant song in praise of life. But Rubens’s contemporaries, due to the state of affairs in their country at that time, read a far more concrete meaning into the work. The Dutch blockade of the mouth of the River Scheldt cut Flanders off from the sea. Rubens’ picture reminded the Flemings of the necessity to get an access to the sea to be able to develop sea trading. The Descent from the Cross (1618),a version of his celebrated altar-piece in the Antwerp Cathedral. The Hermitage altar-piece was painted for the Capuchin Church in Lierre, present-day Belgium. With Mary Magdalene kneeling in the foreground and John, one of Christ’s disciples, supporting the teacher’s head. Christ at the House of Simon the Pharisee (1618), also an altar-piece. A New Testament story. During the feast at the house of Simon the Pharisee (the most faithful disciple of Christ) Mary Magdalene brought some ointment and began to wet Christ’s feet with her tears and wipe them with her hair. The guests said, “If he were a prophet he would have perceived that the woman that touches him is a sinner”. He said, “I entered your house and you gave me no water for my feet. Her sins which are many are forgiven for she loved much.” The treatment of the figures and the introduction of a number of details from everyday life (a dog chewing a bone, servants with dishes of food, an old man looking through a pince-nez at the bare shoulders of the sinner) lend this altar-piece a secular character. Love for the Father. Its subject is taken from the Roman history. A Roman was confined to a dungeon for high treason and he was destined to die there from hunger. So his daughter came to him to feed him with her milk. Bacchus (1638) is a real masterpiece. It is the only picture by Rubens which was not commissioned, but painted by him for himself. It was sold only after the artist died. Bacchus is painted in keeping with Flemish folk spirit. The scene of bacchanalia appears as the embodiment of the “mighty” element of nature. The god of wine Bacchus was usually represented as a young and handsom man. This is not the cas with Rubens. His picture is the apotheosis of human flesh, a hymn to fertility, to the powerful and unbrindled forces of nature. Perseus and Andromeda, dated 1620-1621, treats the subject from Greek mythology. Andromeda was sacrificed to the sea monster for the sake of saving her country. The monster was sent by Neptune to destroy the country because Andromeda’s mother announced that her daughter was more beautiful than Venus herself. Perseus, the son of Zeus and Danae, came flying on a winged steed Pegasus and rescued Andromeda, who was chained to the rock. He defeated the horrible dragon. On his shield there’s the head of the Medusa the Gorgon, at the sight of her all living turned into stones. The painting represents the moment when the winged goddess of Glory crowns Perseus with a laurel wreath. The charm of Andromeda’s naked body lies not in classical austerity but in throbbing life. The Portrait of a Chambermaid. The chambermaid of Infanta Isabella, the ruler of the Netherlands. In the Hermitage there are 25 paintings by Van Dyck, mainly portraits, illustrating different periods of his artistic career. Van dyck was born in 1599 in Antwerp and died in 1641 in London. He was the most successful of Rubens’ pupils and worked under Rubens for a number of years. 1.His Antwerp period. 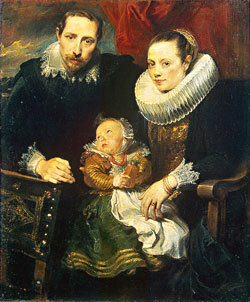 A Family Group with Rubens. 2.His Italian period. In 1621Van Dyck left Flanders for Italy. His favourite artist was Titian. The Portrait of a Man, said to represent Antoine Lumagne, a banker from Paris. The Portrait of a Man, thought to be the Antwerp physician Lazarus Maharkijzus. Came back to Antwerp in 1627. 3.The second Flemish period. Self-portrait. Van Dyck’s life was an unbroken series of triumphs. He lived a very successful life, he was worshiped for his elegance and mysticism. It is well revealed in his self-portrait. He appears before the spectator as a minion of fortune. 4. His English period. The collection is particularly rich in the portraits of his English period. In 1632 Van Dyck was invited by the English King Charles I to come to England. There Van Dyck painted gala portraits of British aristocrats. A full-length Portrait of Charles I, painted around 1638. Charles I (1600-1649) - the King of England since 1625. He was executed upon the decision of the parliament. Next to him is the Portrait of Henriette-Mary, born Medici, the wife of Charles I, the Queen of England. Van Dyck created the whole gallery of gala portraits of the English aristocracy. Snyders (the Shops series, picturesque heaps of fruits, vegetables, game and fish), De Vos (hunting scenes: The Leopard Hunt, The Bear Hunt, The Deer Hunt), Jordaens (The Bean King). The collection of French art in the Hermitage is exceptionally rich. It occupies more than 40 rooms. Here on display are the Limoge enamels of the 15th century, French tapestries and some pieces of furniture. The 16th century Limoge enamels. Religious subjects were gradually replaced with mythological ones and with genre scenes. Medieval convention gave way to a realistic handling of themes, and grisaille (a painting executed entirely in monochrome, in a series of greys) superseded polychrome painting, thus making possible to convey volume, both of figures and of space. The Renaissance artists turned from objects connected with religious worship to the creation of decorative secular articles, such as dishes, jugs and plates. In a large cabinate there are some faiences by Palissy, the inventor of a coloured, transparent glazing which gave pottery additional beauty and durability. His decorative dishes with relief designs of fish, snakes, lizards, frogs, crayfish were tremendously popular. During the 17th century a number of different trends developed in French art. 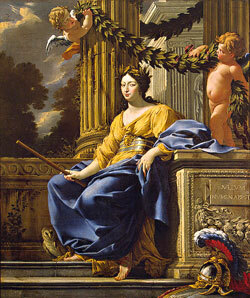 A painting by Simon Vouet, the Portrait of Anne of Austria as Minerva, is a typical example of court art at the time of Louis XIII. The picture is intended to affirm the ideas of greatness and power. Of great importance in 17th century French art was the work of the Le Nain brothers, who portrayed peasant life with great sympathy and respect for the common man. The Milkmaid’s Family was painted by Louis Le Nain, the most talented of the brothers. It represent a realistic trend in French art. The 17th century French Baroque art is represented by the Expulsion of Money-changers from the Temple by Valentin, who was influenced by Caravaggio and knew how to convey the play of shades and lights, and by the paintings of the French artist Bourdon. They are exhibited in the next room. This is the Massacre of Innocents by Bourdon, a typical Baroque multifigural composition to a dramatic subject, with a mixture of contrasting features in one thing. Here it is hard to say where there is a dividing line between life and death, an alive child and a toy, real and imaginary. The Hermitage has a very large collection of paintings by Nicolas Poussin, the founder of Classicism in 17th century French art. In the centre of Poussin’s vision stands Man, endowed with reason, will and spiritual beauty. Such are the heroes of his numerous paintings to the subjects taken from the bible, antique mythology and literature. Tancred and Erminia is a masterpiece, displaying all the elements of Neoclassicism: 1) The artist treated a heroic subject taken from Tarquato Tasso’s poem - the moment when Erminia is cutting off her hair to dress the wound of her beloved Tancred. 2) The painting is quite patriotic: the French national colours were used here by the artist: white, blue and red. 3) One can see a Classical triangle composition. Another famous painting by Poussin is on the opposite wall - Landscape with Polythemus. The painting reveals Poussin’s philosophical outlook. The subject was drawn from Greek mythology. Polythemus is a one-eyed Cyclops who fell in love with the nymph Galathea. He is usually shown crushing the mountains, following the nymph, who was trying to escape him. Here everything is full of harmony. The Cyclops is sitting on the top of a rock playing a reed-pipe, with the nymphs playing with satyrs, and a ploughman tilling the land. In his search for an ideal representation of nature Poussin doesn’t paint from life, but builds up his landscape from separate details observed in nature. Another outstanding exponent of Classicism is Claude Lorrain. He was a famous landscapist who payed special attention to light effects, perspective and the representation of air. We have several paintings from the series “Times of the Day” which convey the state of nature in different lighting: Morning, Noon, Evening and Night. They are all idealized “heroic landscapes” which reflect the desire for harmony and perfection. We’ll continue our tour of French art by passing through the suite of rooms facing Palace Square (or we turn right to take the elevator to the 3d floor, or to the 1st floor and then out to Palace Square). Here’s a small bronze model of a big sculpture of Louis XIV by Francois Girardon. The king is in the attire of an ancient Roman soldier and a wig, such as was worn in the 17th century. The original equestrian sculpture was pulled down during the French revolution, it does not exist any more. A big canvas on the wall is The Magnanimity of Alexander of Macedonia by Mignard. After the victory over the persian emperor Darius, Alexander enters his tent where he encounters the family of the vanquished emperor begging for mercy. With a gesture of his hand Alexander grants the captives their lives. In the figure of Alexander, Louis XIV, le roi soleil, is glorified. was designed by Brullov in the Ecclectic style fashionable in the 1830s. The medalions on the side walls immitate Wedgewood porcelain. The hall commemorates Russia’s victory over Napoleon. In the medallion on the back wall there is the representation of Alexander I in the attire of the Russian prince Alexander Nevsky. The fire-places are richly decorated with martial symbols. The hall is used for temporary exhibitions. There is only one permanent exhibit here - the mahogany clock made in St.Petersburg in the 19th century. It can play 16 different tunes from four operas. Antoine Watteau. The most striking and talented of the early 18th century French artists is Antoine Watteau. The son of a roof-maker, he became a famous master of “galant scenes”, showing silk-dressed ladies and cavaliers. His Capricious Woman is on one side of the stand and The Embarrassing Proposal is on the other side. Wattaeu prefers half-tones, portrayal of feelings. His compositions are light and elegant. Very important is the Savoyard with a Marmot, testifying to Wattaeu’s interest in reality. The great master of Rococo in the middle of the 18th century was Francois Boucher, a fashionable painter, popular with the aristocracy. The Pastoral Scene is the most remarkable among the Hermitage Bouchers. In Boucher’s work we do not see real figures of French shepherds in their ordinary surroundings. The artist painted the French aristocrats in shephards’ dresses. Our collection of the French sculpture incorporates some valuable pieces by the 18th century French sculptor Falconet. All his works in the Hermitage museum were made in France and brought to Russia in 1766 when the sculptor was invited by Catherine II to come to St.Petersburg and create a monument to Peter I. This Cupid is very well known. It was commissioned by Madam de Pompadour to adorn the “Temple of Love” park pavillion. The sculpture was later copied many times in various materials. There are three more marble Cupids like this: in Moscow, Paris, and Amsterdam. The celebrated sculptor Houdon is represented in the Hermitage collection by a number of outstanding works. The museum is fortunate in owning one of Hudon’s masterpieces - the sculptural portrait of Voltaire seated in an armchair. The striking realism with which Houdon presents the great philosopher is characteristic of Classicism, typical of the aesthetics of the time. The statue was commissioned by Catherine II, who was Voltaire’s pen-friend. Catherine bought Voltaire’s library after his death. It is now in the National Public library of St.Petersburg. Catherine the Great’s bust by Houdon is in the corner of the room. The Hermitage possesses a number of the paintings by Greuze, who was held in high esteem by the 18th century Russian lovers of art. He used to paint the heads of little girls with curly hair. This artist represents the trend of Sentimentalism in art. On the opposite wall there are three canvases by Fragonard. The Secret Kiss and The Stolen Kiss are of special value. The October Stairway is decorated in keeping with the Classical style. This is the stairway by which the revolutionaries entered the Winter Palace on October 25, 1917 (November 7 by the new calendar). There is a marble plaque to this effect on the landing. The task was to arrest the ministers of the Provisional Government. The place of sittings of the ministers was the famous Malachite Hall. It took some time until the revolutionaries found and arrested the ministers of the Kerensky government. 3d floor rooms. French impressionists. Mainly from the two private collections of Shchukin and Morozov. Pierre Auguste Renoir, Claude Monet, Alfred Sisley, Camille Pissarro, Edgar Degas, sculptures by Auguste Rodin. Post-Impressionists: Paul Cezanne, Van Gogh, Paul Gauguin (Tahiti period), Henri Matisse, Pablo Picasso (Pink, Blue period, cubism, abstractionism). Albert Marquet, Pierre Bonnard, Jean Edouard Vuillard, Andre Derain, Henri Rousseau, Paul Signac. Brullov’s suite of rooms. Rooms in the Ecclectic style. The White hall (white moulding, an inlaid floor, the paintings by Robert, some pieces of furniture by the 18th century Germain furniture maker David Reuntgen, a blue Sevre vase); the Gold sitting-room (cameos, mantle-piece with a mosaic panel); the Crimson corner sitting-room (Wedgewood porcelain, the dinner-set with a green frog); the Boudoir (mirrors, the handles of the doors, no pictures at all); the former Bedroom (temporary exhibitions). The Department of Russian culture (Catherine the Great’s time) or the room with the sleigh decorated with St.George slaying the Dragon and the portrait of Elizabeth on horseback and then along the Dark Corridor (tapestries made in Brussels, Italy, France in the 16th, 17th, and 18th centuries. The Rotunda Hall was constructed in 1830 by Montferrand and restored by Brullov with some alterations after the fire of 1837. In the middle of the room is a reconstruction of the Triumphal Column commemorating Peter’s victories in the Northern War with the sculpture of Peter I on the top and battle scenes of the Northern War decorating the column. By the sculptor Rastrelli. The Moorish Saloon next to the Rotunda was constructed from a design by Brullov. It received its name from the guard of Negroes (or “Moors” as they were called in the 18th and 19th centuries). It is used for temporary exhibitions. The Private Dining-room.The windows of this room face the inner yard. The room was designed by Briullov as a private dining-room. In 1894 the architect Meltzer redesigned the room in the Second Rococo style. The walls are decorated with the 18th century tapestries of Russian make allegorically representing Asia, Africa and America. The fourth one is called The Swans. The furniture of light colour is also made in the Rococo style. The marble plaque on the mantelpiece reminds us that in this very room the ministers of the Provisional Government were arrested at night time on October 25, 1917. The clock was stopped to show the time when that had happened - 2.10. This room was the main sitting-room in the apartments of Nicholas I’s wife. After the fire it was decorated by Brullov. The room got its name after a semi-precious Ural stone malachite which faces the columns, pilasters and two mantelpieces. Over two tons of malachite were used on the decoration of the room. The floor is inlaid with nine different types of wood. There is a painting on artificial marble on the wall opposite the windows. Since July 1917 the Winter Palace became the residence of the Provisional Government and it was in the Malachite Room that the Provisional Government had their sittings. During the night of November 7 (October 25 by the old calendar) the last meeting of the Provisional Government took place here. Upon the storming of the Winter Palace the ministers took cover in the adjoining room where they were arrested. 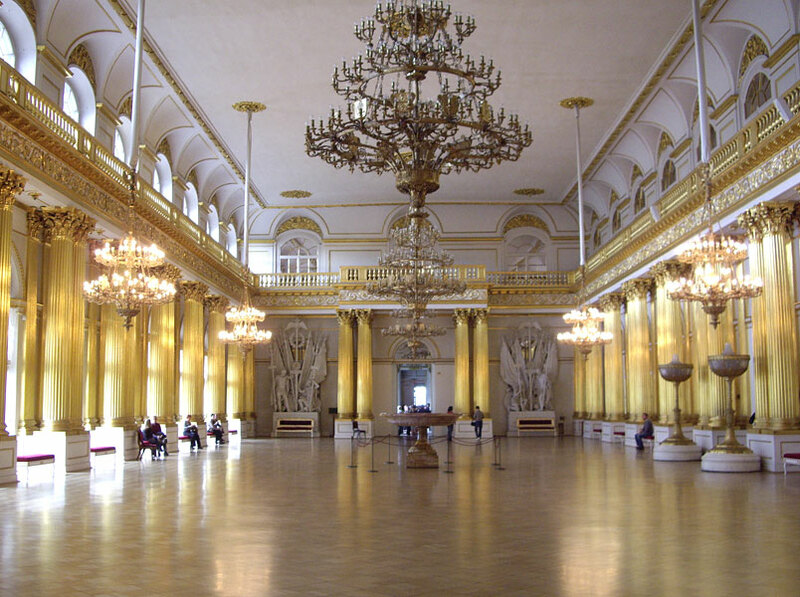 designed by Stasov is the largest of the ceremonial rooms in the Winter Palace. It covers the area of over a thousand square meters. It used for temporary exhibitions. Like the Concert Hall it is in the Classical style.